(Phys.org)—A planet that is not orbiting a star, effectively making it homeless, has been discovered by a team of University of Montreal (UdeM) researchers working with European colleagues and data provided by the Canada-France-Hawaii Telescope (CFHT) and the European Southern Observatory's Very Large Telescope (VLT). 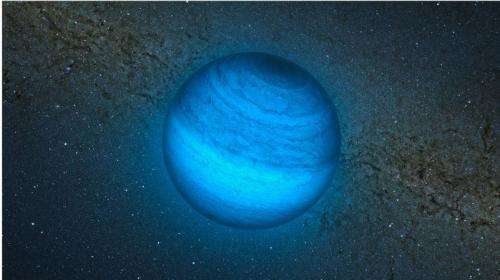 "Although theorists had established the existence of this type of very cold and young planet, one had never been observed until today," said Étienne Artigau, an astrophysicist at UdeM. The absence of a shining star in the vicinity of this planet enabled the team to study its atmosphere in great detail. This information will in turn enable astronomers to better understand exoplanets that do orbit stars. Free-floating planets are planetary-mass objects that have no gravitational link to a star. "Over the past few years, several objects of this type have been identified, but their existence could not be established without scientific confirmation of their age," explained Jonathan Gagné, a doctoral student of physics at UdeM. "Astronomers weren't sure whether to categorize them as planets or as Brown dwarfs. Brown dwarfs are what we could call failed stars, as they never manage to initiate nuclear reactions in their centres." Gagné and Artigau, along with Lison Malo and Loïc Albert, all of whom are astrophysicists with UdeM and the Centre for Research in Astrophysics of Quebec (CRAQ), were able to find this planet with the assistance of French astronomers. Philippe Delorme, of the Laboratoire d'Astrophysique de l'Observatoire de Grenoble, was lead researcher. The planet is in fact called CFBDSIR2149 and appears to be part of a group of very young stars known as the AB Doradus Moving Group. "This group is unique in that it is made up of around thirty starts that all have the same age, have the same composition and that move together through space. It's the link between the planet and AB Doradus that enabled us to deduce its age and classify it as a planet," Malo explained. First of all, the researchers obtained a series of infrared images of CFBDSIR2149 using the 3.6 metres in diameter CFHT. They then used the full strength of the 8 metres in diameter VLT to deduce its mass, its temperature, and of particular note, its age. The planet was found to be between 50 and 120 millions years old, with a temperature of approximately 400 degrees celsius, and a mass four to seven times that of Jupiter. Objects more than 13 times the mass of Jupiter are not considered to be planets but rather Brown dwarfs, as it is this is the minimum amount of mass required for the deuterium at the heart of a star to achieve fusion. As an aside, it is interesting to note the significance of the finding in terms of the roots of the word "planet." "Planet as a word originates from the Latin word planetus, which originally comes from the Greek words planeta or planêtês, meaning moving or wandering celestial bodies, as opposed to stars which appeared to be in a fixed position in the sky," said Oliver Hernandez, an astrophysicist at UdeM. In short, this is the first isolated planet – perhaps flung away during its formation – that is not tied by gravity to a star and whose mass, temperature and age meet the relevant criteria. This discovery, which has been sought after for more than a decade, supports theories relating to the formation of stars and planets. Moreover, it supports theories that suggest that these kinds of isolated objects are much more numerous than currently believed. "This object was discovered during a scan that covered the equivalent of 1000 times the surface of the full moon," Artigau explained. "We observed hundreds of millions of stars and planets, but we only found one homeless planet in our neighbourhood. Now we will be looking for them amongst an astronomical number of sources further afield. It's like looking for a single needle in amongst thousands of haystacks." Would it not be more correct to refer to it as a failed star? 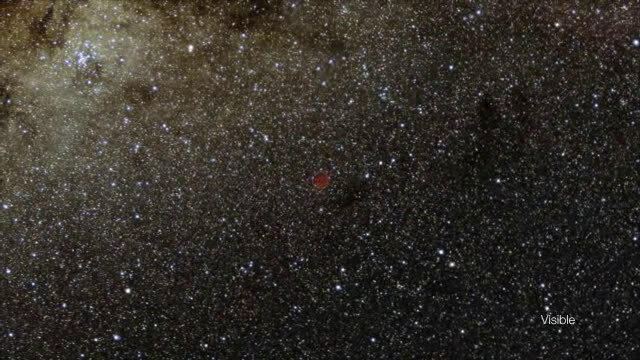 "This object was discovered during a scan that covered the equivalent of 1000 times the surface of the full moon,"
This is still only half a percent of the area of the sky. They don't go on to mention exactly which theories it supposedly supports, hence this statement is pretty meaningless. So far it only means that an obviously unconnected/disconnected planet has been found. There is no way at this stage to indicate just how the planet got to exist or how it got to where it has been discovered. So any support for any theory is simply imaginary - i.e, it's sheer speculation at this stage. Unless and until it can be fully supported by observations of planets actually being ejected from a particular system, it will remain exactly that - pure fantasizing. Oh Kevin, still raging against science I see. Some articles are meant as an overview of the findings and do not provide definitions of every theory mentioned. The only data you will support is direct observational evidence, which due to time and distance scales in astronomy, is rare. Good thing you directly observed Noahs Ark, if not believing is such a thing would be, as you say, "pure fantasizing". i believe these are far more common than cosmologists currently agree upon. now the question is what exactly is the difference between a Y-class dwarf and jupiter. it's all shades of infra-red. cold giant gas ballz not fusing hydrogen are simply that. whether its a planet homless or a non-fusing star by itself is just a label. how we categorize them amongst a spectrum of labels is a largely tedious task. i believe , what we are seeing is the semantic difficulty that once emerged with the decision to dispute plutos status as a planet. what has changed about pluto since we stopped calling it a planet, ironically, multiple more moons have been discovered. how's that for irony? where before there was 1 now there are agreed to be over 4 moons of pluto. perhaps by the time they agree this object is a y-class dwarf. they will establish more planetary qualities of the object. Such as the claim of an anthropomorphic deity you favour which appears to be unable to communicate effectively to anyone, has never been observed, leaves no unequivocal evidence such as an indestructible bible or the recorded location of a garden of eden or location of a cave where jesus was observed leaving by 'hysterical women'. ie. is completely impotent or non-existent, choose your best poison please and maybe try doing it by scientific methods since you are on a science website but never trained in the discipline of science ? What is the discipline of any religion please kevinrtrs ?? Is Eris considered the 9th planet & there is hint of a 10th? Yes agree fully with what you say re labels, there are bound to be coalescences of gas clouds & post supernovae deleterious which forms masses which haven't had the critical mass (yet) to ignite & with a huge divergence of momentum vectors too. Just one more reason all nations should put effort into surveys for any moving bodies which might impact earth & with expediency! Together with that, more effort into supporting companies like SpaceX to produce more launch vehicles, offer competitions & prizes to students worldwide to craft ideas of how to deal with wayward asteroids, comets etc, thus build solid technology foundation. This is one way to destroy for ever the god of suffering claimed to exist by kevinrtrs & allow his unthinking robots to do something useful ! I wonder if it has a moon? One day our telescopes will be able to see such details. As for the abundance of such objects, I think his comment about them being far more numerous than thought is premature. I agree with him that they are probably common, but common sense isn't the same as evidence. Be careful, its probably depressed enough as it is. This body might appear now as a failed star but who knows how far away it is in time or space in being able to acquire more material, all these things MUST be seen in a greater dynamic context. You never know how or when it could acquire either more gas, comet material, another body etc and then ignite. This thing should be tracked & the search accelerated for any other such bodies, especially those might intersect with our own gas giants. Although 2010 by Clark was a nice story, its not that far from the permutation space. Jupiter continues to acquire material, it might be a long way from getting enough based on recent history but, history is not the best judge of what might happen in an essentially chaotic system. Any number of wayward objects could cause any other of our large planets to later collide etc, binary system anyone, getting common ? Pluto is not a planet, it's a Kuiper Belt object. There is a lot more than Eris out there and if you consider Pluto to be a planet you must consider all the comparable Kuiper Belt objects as well. They formed differently. They behave differently. They are not planets. Pluto isn't even the largest of the bunch. What about Ceres? There are good reasons for not considering these objects as planets. I guess we should consider every object that directly orbits the sun a planet, right? Good luck remembering the names of every object in the Asteroid belt and everything beyond Neptune. The eight planets all have something in common. They orbit the sun in the same plane. This hints (don't want to offend Kevin) at a shared origin with similar processes working on the planets. The asteroid belt is different, likely a demolished planet and deserves a different classification. The KBO objects also deserve a similarly different classification. Planets are planets. KBOs and asteroids are not. My question about the planet/failed star, whatever, is how far away is is supposed to be? Both the ESO website and space.com say it's about 100 light years away. I've never seen anyone willing to declare for sure whether it is gaining or losing at a faster rate. It is certainly venting to space at the same time that it collects dust and debris. Which one is happening faster is an open question as far as I know. I agree with your previous comment regarding the danger level of interstellar objects. Loose objects transiting accross our path in the Milkyway are certainly the most dangerous possible objects in our local region. A common asteroid or comet has a velocity of around 40k mph when it gets to our orbit in the solar system. For interstellar objects, the potential speeds are far beyond that. We would be powerless to do anything about even a bus-sized object moving at 500k mph. I have to disagree with you on this. The planet was discovered with existing technology. It is in a region of outer space that is a mere fraction of the viewable sky. The discovery is almost miraculous, imo - and I'm happy with it. It's doubtful that planets being ejected from systems is a daily occurrence. Don't hold your breath waiting for it to happen...or record its happening. The finding is a happy accident. Religion and belief in God has nothing to do with it, I'm almost certain. But, if you prefer to link it to religion, perhaps ejected, wandering planets are simply the natural order of what God intends. It may be on its way to crash into another planet in a solar system...just as science tells us that it has happened to Earth long ago. Its like M. Bachmann saying there is no study that CO2 is bad, some things are just self evident. Given Jupiter has a much higher mass than earth and a much higher gravitational field, just what do you think it is venting that might come close to equilibria with it attracting ? Perhaps H2, the lightest gas, maybe the astrophysics suggests the reverse, massive magnetic field is also likely to trap many protons and a sizable number of anti-particles too - as deleterious from high energy gamma ray collisions. Much like the suggestion earth's field can do the same. One or more of the recent 'unusual' military flights could have carried instruments to check/trap earth's anti-matter too! Given the hodgepodge of planets in our solar system, who's to say that some or all of the gas giants didn't form in such a solitary manner, and were then captured by the Sun. Such a suggestion may explain oddities such as Uranus' orbital spin and the wide variety of chemical make-up seen in the various planets. I read years ago Earth is putting on anywhere from 400 tonnes to 40,000 tonnes per day, one reason why the earth's rotation rate is slowing, the other being tidal forces. With an implication any rocky core has dissolved into the hot high pressure metallic hydrogen, the properties of this material would be difficult to replicate here but might be fodder for cold fusion research in conjunction with high current discharges ! Note that the moving group contains ~ 30 stars. This observation alone nearly saturates the "one rogue for one system" bound of microlensing observations. It is also overdue as the closest such rogue, to not strain those observations as regarding our own neighborhood. So, both a nice find and a nice test of earlier predictions from exoplanet hunters. "In short, this is the first isolated planet – perhaps flung away during its formation – that is not tied by gravity to a star and whose mass, temperature and age meet the relevant criteria." It is the first such planet detected with that method, that is. Microlensing has captured a handful of rogues in the last few years. No, there rogues are likely made in protoplanetary disks. You are thinking of brown dwarfs, which likely forms analogous to stars. "Ooh i just cannot WAIT until the JWT launches..."
It will never be completed, or launch. America is bankrupt. Creationists shouldn't comment on science. It is hilarious to see. The article don't describe old, accepted science or, in this case, the science front, no. It is meaningless to do so, while noting the relevant theories is obviously meaningful. - Current planetary system formation models predict 1-2 ejected planets/system. 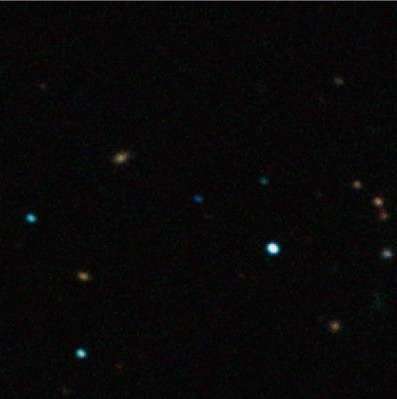 - Current microlensing observation have tested that prediction and gives 1-2 rouges/system. - Our own system formation model, the Nice model, got better predictivity by adding 1 (or 2) ejected giants. It allowed a thicker initial disk so Neptune and Uranus grows to their observed size more often in runs testing the model. All in Wikipedia already. Just read about the science. Nope, rogues are observed at the rate predicted. And this observation specifically relaxed the models as far as our own neighborhood goes. See my two previous comments. And planets that forms in disks forms differently from the dwarfs you mention. @ Sonhouse: The AB Doradus Moving Group is ~ 20 parsecs away IIRC. The planet is weakly IR emitting, so must be close. They are checking up weak orbits, yes. Fairly excluded, not fully. @ kornus: See previous comments on planets vs dwarfs. The dichotomy isn't completely tested, but I believe the weight of data and the consensus comes down on it. That planets can form but not larger system comes down to gravitational clumping of the molecular clouds that systems form out of. The clumps are so large that they make larger objects than planets, they seem to make isolated brown dwarfs as smallest objects. @ obama_socks: Rogues are predicted to be captured by other systems at times, but into orbit. Earth was hit by a planetesimal during system formation where these were building planets, a different process. @ cantdrive85: Science is to say it didn't happen. It couldn't happen at the same time we observe all planets co-orbiting the Sun, having the Sun consistent isotope ratios et cetera. Pardon my concern here but doesn't it seem rather unusual an essentially chaotic process with a potentially large set of permutations & in respect of starting conditions over very long periods seems to result in a remarkably deterministic precision in respect of number of ejections AND that these 'seem' to be corroborated (so far) with observations...? Could you indicate the 'normal' distribution stats in respect of these 1 to 2 rouges & in terms of variance of relative levels of starting materials, presence or otherwise of prior rogues in the early stages of accretion etc. Or in fact any of the combinatorial statistics to make sense of how the probabilistic -> deterministic asymptote can possibly arise ? @ GSwift7: Jupiter is too large to lose hydrogen swiftly. It is likely netting mass, since Earth is. I wasn't meaning to say that either is actually losing mass, just that it's not certain either way. That balance is only a rough estimate. The quantities are so small compared to the error margin that it's not a very certain figure. The error margin actually allows for the balance to be negative, though it's not very likely. Based on the other guy's comment, he didn't seem to be aware of that. The notion that a planet like Jupiter could ever accumulate enough mass in this manner to become a star is absurd. Even if we drifted into a nebula, the outward pressure of the Sun would prevent that from happening. The Sun will go nova first. It's a matter of time scales and relative rates. Looks like you are backpedalling here. Where is there any suggestion in print regarding these particular error margins and especially in respect to comparative measures of 'quantities' ? The artical is a scare monger by saying it is the closest object of this nature to our system. Just HOW FAR is never mentioned. Curious minds would like to know! Re: Curious minds - Ha !, If you actually bothered to check the link PROVIDED you'll find its in the "AB Doradus" group (mostly) so dont be scared now yah'hear. LOL Mike_Massen...you are a card. There are a lot more scary objects closer to us than a homeless planet that we WILL have to deal with sooner or later. But in the meantime, my ex-wife asked me about what are the chances Earth will get hit by something big like another asteroid the size of Manhattan. I told her that her chances of getting a job and finding a fool to marry so I can quit sending her alimony money is far greater than Earth getting a direct hit by anything. Just an educated guess. Orbits are essentially chaotic with only the illusion of determinism as our lifespan is so feebly short FFS ! Governments spend so much on useless dead-end politically expedient idiocies eg war posturing when education in concert with a national industry such as comet/asteroid searches and competitions to advance automatic search methods with universities would raise the local technology base. We seem to be little more than moderately intelligent primates with the illusion of achievement whilst our base nature seems static. So you are saying its coming at us head on direct in line, no left/right or up/down perceptible change ? Should we hope this sort of thing happens - for a while ?